For as long as I’ve been VJing I’ve always been pining for a decent hardware controller to control our software. Unfortunately I’ve never found a controller that did everything right. Some were more appropriate than others but it was always a case of too many/too few buttons, dials or faders. The original Lemur controller was a break through device – why not just a big touch screen for a controller? Unfortunately back then the Lemur was ahead of its time and its cost just made it an extravagance any normal VJ. Fast forward to today and the Lemur has been re-imagined in the form of Hexlers TouchOSC iOS & Android app. Users could draw up the layout they wanted and then sync them direct to the devices which in turn would send the OSC commands over Wifi. From there you can use Modul8’s OSC Module to send and recieve commands. Unfortunately one downfall of this is that you’re limited to its internal Keyword for commands. As a result I’ve gone with the fantastic OSC translator OSCulator as an intermediatry between the iPad and Modul8. It allows you to assign Midi commands to be each OSC command. Another bonus is that is seamlessly supports Midi receiving so when used along side UDART’s Two Way Midi module you can have all your buttons in sync with their states on the screen. 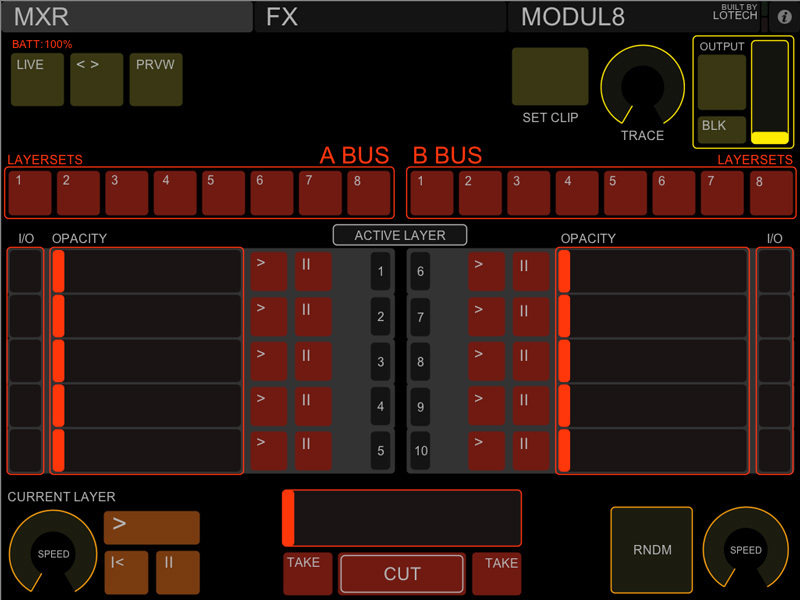 A lot of the functionality included on this layout is designed to be used in conjunction with my modules (LT) Live Monitor, Clip Control & QuickFX. Although they’re certainly not necessary and can just be deleted.